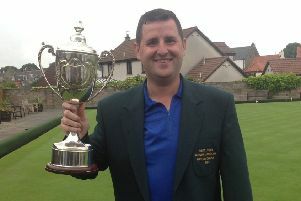 The 44-year-old defeated his veteran Linlithgow club-mate, 67-year-old Alastair Stenhouse, in the final to claim the Johnston Oils of Bathgate sponsored £1000 title. Dunnett’s previous wins were achieved in 1999 as the inaugural Master under the Queensferry banner then in 2007 as a member of Kirkliston. The climax of the £4000 20th week-long Masters event of the WLBA staged at East Calder was a 21-14 triumph for No.4 seed Dunnett who, having pushed on from 13-9, had the silverware firmly in his grip at 20-11 and he triggered the victory salute with a single three ends later, the 22nd. Dunnett had defeated Martin Byrne (Linlithgow) 21-17 in his quarter-final then transformed a 15-9 deficit into a 21-15 win over Alec Allan of Newbridge in the semis. Stenhouse may not have basked in the limelight of the Masters applause but having taking the scalps of No.15 seed Darren Pearce and No.3 seed Gary Smith the massive demands on his stamina of a high pressured three-match schedule earned him great admiration. 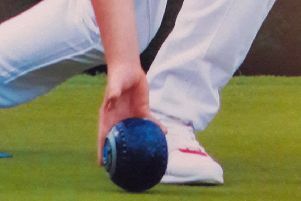 n It has been a patient and dedicated four-year journey but Carrick Knowe have arrived at their targeted destination with the former giants of the Water of Leith League set to parade their skills in next season’s Division 1 of the Alpha Trophies Edinburgh Bowling League. Carrick Knowe have clinched promotion as champions of Division 2 having collected the titles of Divisions 5, 4, and 3 en route – a history-making achievement made possible by the club being forced by their peers to start life on the bottom rung. The member clubs of the EBL – by majority not unanimous – were merciless in making it a condition of switching allegiance that the champion club of their rival league start life in their lowest division. Carrick Knowe took that imposition on the chin as the membership had come to accept that the future of the sport in the Capital and competitive development of their players was best served by competing in the EBL. Finishing in the top two in Division 2 wasn’t an issue going into this week’s 14th and final round of fixtures as the third club (West End) finished 20 points adrift. However their effort to win the title went right down to the wire. Postal represented a real danger and their 8-1 win at home to Willowbrae was a brilliant effort that saw them finish with 86 points – would that be enough? Carrick Knowe had a tougher assignment away to strong home side Hillside but dug deep to achieve a 7-2 victory that put them on the same points as Postal. Shot difference was the deciding factor with Carrick Knowe + 253 compared to the +214 of Postal. Inaugural 1998 then 2008 Division 1 champions Pilrig have now dropped down to Division 3 having finished foot of the table and are joined by Willowbrae. Craigentinny finished with a 5-4 away victory over Northern and their 13 wins out of 14 was a brilliant campaign that richly deserved them being crowned Division 1 champions for a record-extending 10th time. Queensberry – promoted as 2017 Division 2 champions – finished by crushing Parkside 9-0 and finished in third place just two points adrift of Maitland who kept their nose in front with a 7-2 win over Summerside. Summerside are relegated but the shock climax of the campaign is that Tanfield – once five-times-in-a-row champions – will also spend next season in Division 2. The six times champions were in a dog fight for survival and despite home advantage lost a 5-4 thriller to a Brunstane team that survived by that single point – Summerside 47, Tanfield 47, Brunstane 48. Sighthill and Bainfield – on the same journey as Carrick Knowe – have represented their proud Water of Leith history well by finishing first and second in Division 3. Sighthill (90) beat Leith 7-2 away from home while Bainfield (81), 5-4 away winners over Dudley made it by the skin if their teeth (½) over Corstorphine, 9-0 away winners over Mayfield. Dudley (48) and Whitehouse & Grange (33) are relegated. Slateford – another giant of the Water of Leith – with 79 points, won promotion from Division 4 having finished in second place to Dean (83) and six points ahead of Gorgie Mills while Seafield (42) and Blackhall (28) are relegated. n Tomorrow’s final of the E&L Top Five Singles features Maitland and Bainfield at Parkside (2pm).The semi-finals action saw Maitland beat Tanfield, 3-2, and Bainfield beat Goldenacre, 3-2. Monday’s semi-finals of the Jack High Insurance WLBA Junior Open for The Fred Meikle Trophy features Calum Melrose (Deans) V Jamie Aitken (Newbridge) and Mark Thorburn (East Calder) v Stuart Ford (Armadale); both at Mid Calder. Melrose beat four-times champion Calum Logan (Kirkliston), 21-15 in his quarter-final. Bathgate BC host the final on Friday night (17th).